When changing the look of a room or completely renovating the design, it’s important to give the floor material the upmost attention. You need to find something that has the necessary qualities for your needs. In the living or dining room, carpet is often a household favourite, but for the kitchen or bathroom this simply won’t cut the mustard. When it comes to these two rooms you’ll want to find something that’s durable, hardwearing and water resistance. Tile offers this in abundance. Floor tiles don’t have to break the bank and you can have a floor tiled for little outlay. Even the cheaper tiles will have fantastic qualities and last for years. Floor tiles are suitable for kitchens and bathrooms especially, because they’re so easy to maintain. Any dirt can be removed quickly with a cloth, mop or brush. You don’t have to worry about stains in the same way as you would if a carpet were laid. You’ll be using your kitchen and bathroom a lot over the years so it’s important to have a flooring surface that’ll last well for years, is hardwearing and also resistant to impacts. And of course, this is all with little maintenance required. With tiles you have a wide range of choice, from lavish, decorative designs, to a plain finish. This means you can always find something that will match the walls and work surfaces, giving your room a great end look. 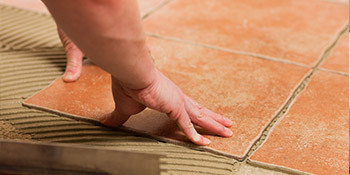 If you’ve already purchased your floor tiles and need a vetted professional to fit them, you’ve come to the right place. By completing our quick form below you’ll be able to receive up to four FREE tile fitting quotes from local, vetted and reputable professionals. Project: 30 sq.mtr.X 65 mm screed over celotex insulation for annexe. Supply and lay . Project: Not sure if garage floor has cement or screed but it's very coarse. I need to lay some PVC tiles but need a professional to either sand it, if it's already screeded, or screed it. Project: Need 22metre sq. Replacement floor boards plus underlay. Finding a builder that could provide exactly what I wanted.